Dr. Frank Bryant: Well, in his poem, 'The Wild Swans at Coole', Yeats rhymes the word 'swan' with the word 'stone.' There, you see? That's an example of assonance. Rita: Oh, yeah. It means getting the rhyme wrong. Educating Rita is a pleasant variation on George Bernard Shaw's Pygmalion. It doesn't provide the sheer joy My Fair Lady brings to the screen, but it contains witty insights and two exceptional performances from its leads. Mixing comedy and drama, director Lewis Gilbert and writer Willy Russell (adapting his own play) craft a deeply human story that combines the cinematic delight of Roman Holiday with the literary pleasure of Shaw's work. Dr. Frank Bryant (Michael Caine) teaches literature at an English university, but his true ambitions lie in finishing a bottle of booze hidden behind his copy of The Lost Weekend. Another semester begins and Frank finds himself bored with the superficial, rehearsed comments of his students. 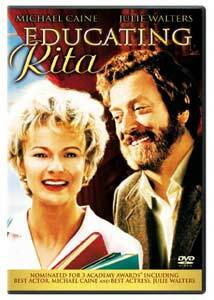 Things change, however, when 26-year-old Rita (Julie Walters) enlists him as a tutor. By meeting with the alcoholic professor, Rita hopes to discover herself and rise above her working-class background. Her unique personality captures Frank's fancy, resulting in a symbiotic relationship where each learn from one another. The first half of the film plays as an all-out British comedy, with sharp dialogue and wry humor at every turn. From Rita discovering the exhilaration of Shakespeare's Macbeth to Frank lecturing his students while under the influence, the laughs come often and work to reveal character. Things become far more serious, however, during the second half of the film. When Rita refuses to have children, her husband Denny (Malcolm Douglas) divorces her and the once chipper girl is ready to fall apart at the seams. Only through Frank's tutoring can she overcome her sense of failure, but once her education is complete their flourishing friendship begins to teeter. Frank is again alone with his bottle, ruining his life as the tables turn and Rita must teach him the merits of life. I can't pretend that the story is original, but it feels truthful and never opts to give the audience an easy way out. Frank and Rita are real characters, full of their own strengths and weaknesses that find them meeting at a crossroads; a lesser film would force a love story between them, but these characters are played as living on separate planes that only briefly intersect. Caine's performance is one of his best—he plays Frank as both pitiful and charming, creating a comedic tension during the film's evocative conclusion. Walters equals his work throughout, bringing a warmth and charisma to Rita that compliments the lethargic Frank. These two actors have great chemistry together and that is the most important aspect of a film such as this. What this is, really, is an actor's movie. Gilbert's direction puts the emphasis on their performances and lets the film's style take a back seat to the acting. His only error is the unfitting use of a synthetic score, but otherwise the reserved visual and editing style perfectly aid the actors. The result is a simple, honest comedy that, at the risk of sounding clichéd, will make you both laugh and cry. Image Transfer Review: The anamorphic 1.85:1 transfer doesn't hold up too well. The overall appearance is fairly bland, with colors being muted and a significant amount of mosquito noise and print defects. Detail is marginal and there's a noticeable amount of grain, as well. There's nothing here that is so bad as to ruin the viewing experience, but this is merely an average transfer. Audio Transfer Review: The mono track comes across as a faithful presentation of the original theatrical experience. There's nothing fancy about it, but dialogue is always audible and the mix is fairly clean. A French mono track is also available. Extras Review: Apart from the trailers for For Pete's Sake and The Remains of the Day there are no supplemental features on this disc. Its nice to see Sony putting out some catalog titles, but this release doesn't exactly shout "must-have." Anchored by its leads, Educating Rita is a touching comedy. This barebones DVD leaves much to be desired, but the film is worth seeing nonetheless.